Visit the Patterson Park neighborhood on a warm Saturday afternoon and you’ll see why young, energetic homebuyers are joining the generations of Eastern Europeans who made this neighborhood home. In the 19th century, immigrant European laborers as well as free blacks like Frederick Douglas flocked here seeking jobs in the waterfront factories, rail yards and wharves. Blocks upon blocks of rowhomes were built around Patterson Park to house these working masses. Today, neighbors, young and old, gather to plant trees on their blocks. They walk their dogs in the park or hop on their bikes and zip to nearby Fells Point for lunch on the water. They gather on their stoops and gossip about the day’s events—a classic Baltimore pastime. Just like the women—captured in black and white pictures of Patterson Park’s past—scrubbed their marble steps every Saturday until they shined, today’s Patterson Park residents take pride in their homes, sweeping sidewalks and grooming flower boxes. The Patterson Park neighborhood adjoins 155-acre Patterson Park, which offers several ball fields, tennis courts, an ice rink, a boat lake, a new pool, the Baltimore Sport & Social Club and the Pagoda. The Pagoda, designed in 1890 by Charles H. Latrobe, still stands on its original site in Patterson Park. Three-story Victorians built circa 1900 to 1910 line the park’s border. Two-story rowhomes dating from the 1920s line quaint and narrow side streets, some still paved with brick. Interiors often feature pressed tin ceilings, hardwood floors, stained glass windows and ornate moldings. Many houses still have original marble steps. 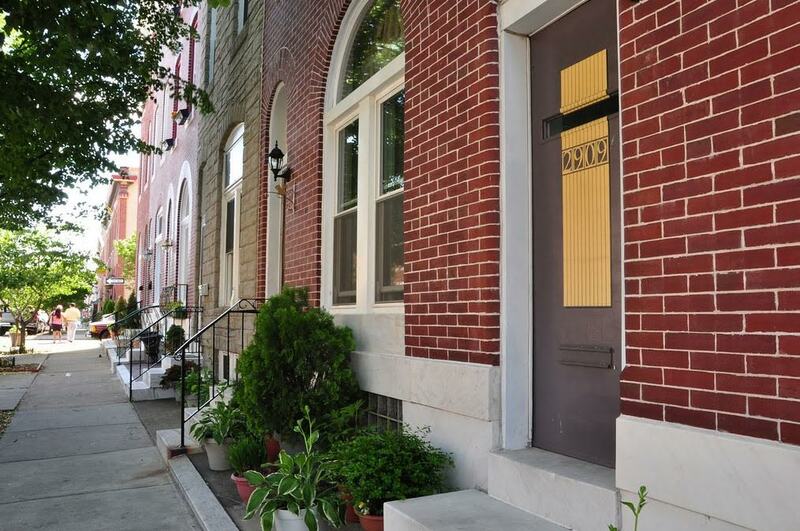 Some of Patterson Park’s rowhomes have been beautifully renovated by the Patterson Park Community Development Corporation (PPCDC), which turned vacant rowhomes into modern sanctuaries. On Decker Street, the organization built green “Envirowhomes” that appeal to environmentally conscience homebuyers. PPCDC has been a force for positive change in Patterson Park and continues to encourage neighborliness and foster resident volunteerism. One of its newest initiatives is gated alleys where residents gate both ends of an alley and make it a park-like space for neighbors to enjoy. Many of Baltimore’s festivals and events take place in Patterson Park. In a year’s time you can gorge on pierogies at the Ukrainian Festival, dance to pounding beats at LatinoFest and watch manmade, man-powered sculpture dash through a mud pit during the Kinetic Sculpture Race. Friends of Patterson Park offers a roster of activities and volunteer opportunities for residents. A growing number of new businesses have made Patterson Park home. The restaurant Three… offers a hip setting with inventive cuisine and outdoor seating along the park. Patterson Perk, a funky coffee shop on the southern border of the park, fuels neighborhood denizens on their way to work. A short walk west brings you to Life of Reilly, an Irish restaurant and pub with delicious bangers and mash and European football matches on TV. Roman’s, a small bar tucked away on a Decker Street, offers a homey, rustic setting. The burgeoning Latino population in Southeast Baltimore has encouraged Latino-owned businesses to grow in and near Patterson Park, giving residents a taste of Hispanic food and culture.